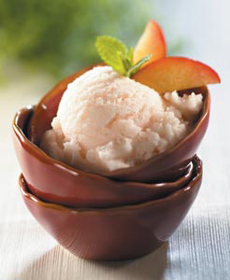 With all the luscious fruit coming into season, it’s time to make easy fruit sorbet. You don’t even need an ice cream maker. You can make granita in a plastic container or the bottom of a metal ice cube tray. Unlike ice cream and frozen yogurt, sorbet is dairy-free, fat-free, cholesterol-free, vegan and free of the eight major food allergens (eggs, fish, milk, peanuts, shellfish, soy, tree nuts and wheat). If you limit your sugar intake, when you make your own sorbet you can substitute low-glycemic agave nectar or the non-caloric sweetener of your choice. Use this template to make any fruit sorbet recipe: apple, berry (blackberry, blueberry, raspberry, strawberry), citrus (grapefruit, lemon, lime, orange), melon (cantaloupe, honeydew, watermelon), pear, tropical fruit (kiwi, mango, pineapple) and stone fruit (apricot, cherry, nectarine, peach, plum). 1. BRING the water and sugar to boil, then lower heat and simmer for five minutes. 2. REMOVE from heat and cool completely. Combine with the fruit purée. 3. PLACE in an ice cream maker and follow the manufacturer’s directions. 4. FOR GRANITA: If you don’t have an ice cream maker, make a granita. Put the mixture in a plastic container and place in the freezer. When it begins to freeze, stir every 10 minutes to break up the ice crystals, until completely frozen, for approximately one hour.